Will Minor League Baseball Come to Wilmington? As the first Opening Day in 33 years without a Kinston, N.C., franchise in the Carolina League approaches, another longtime league member may also be on the way out. The Lynchburg Hillcats, based in Lynchburg Virginia, which have been a part of the Carolina League since 1966, may be moving to Wilmington, N.C. The Lynchburg metro area had a population of around 245,000 in 2010, compared to Wilmington’s approximate 360,000. The Hillcats’ owners have reached a tentative agreement to sell the franchise to a joint partnership with the Atlanta Braves and Mandalay Baseball Properties. It may be possible that the move could be completed for an opening game for the 2014 season. The biggest hurdle for the deal to be completed is construction of a baseball stadium in New Hanover County. The sale is contingent on the new park being built, and at this point the city of Wilmington does not know where the park would be or how it will be financed. Mandalay Baseball CEO Art Matin said that without significant public financing, the deal won’t happen. In February, 2012, the Wilmington, NC, city council unanimously approved to study the proposal. Proponents believe that the proposed stadium will bring significant increases to our local tourism industry. They say that it would be the area’s largest attraction adding that fans will come from outside the county bringing with them their money to spend boosting the area economy. Wilmington’s mayor Bill Saffo has said that a new ballpark would require support from local residents. Opponents of public financing for the stadium have circulated a petition to require a referendum on using public money for the project. As of May, 2012 support for minor league baseball in Wilmington has grown. Jim Hundley, Jr. is president of the Wilmington Ballpark Coalition which was recently formed and he says his groups’ membership has steadily grown. He recently said that they currently have more than 60 members, and that they are expecting to grow to over 100 members very soon. Hundley has told members he believes the project will provide a big boost to future economic development, citing as an example Durham, NC which experienced $900 million growth in private and public investments after their stadium was constructed in the late 90s. 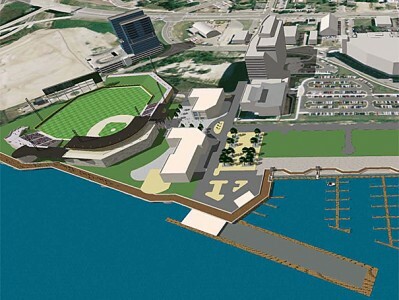 The Wilmington Area Hospitality Association which represents hotels, restaurants, and other local businesses conducted an online survey regarding the proposed baseball stadium in downtown Wilmington, and they reported that over 95 percent of its members said they supported the project. On Wednesday, May 9, the City of Wilmington held its second public information meeting about bringing minor league baseball to New Hanover County, and turnout by the public was low. There were more city staff members and members of local media than citizens at the meeting. The meeting was an opportunity for the public to give input about where to build the stadium and if there is support for a tax increase to help fund the project. Issues such as costs, infrastructure requirements, and operating costs were addressed. Maybe the lack of public attention indicates a waning of opposition of the project. The opponents had been very vocal in the past. There is supposed to be another survey on the issue released on Friday. In June, the project’s management group plans to present a feasibility study to the city council on potential locations and financing options for the stadium. Posted in News | Comments Off on Will Minor League Baseball Come to Wilmington?